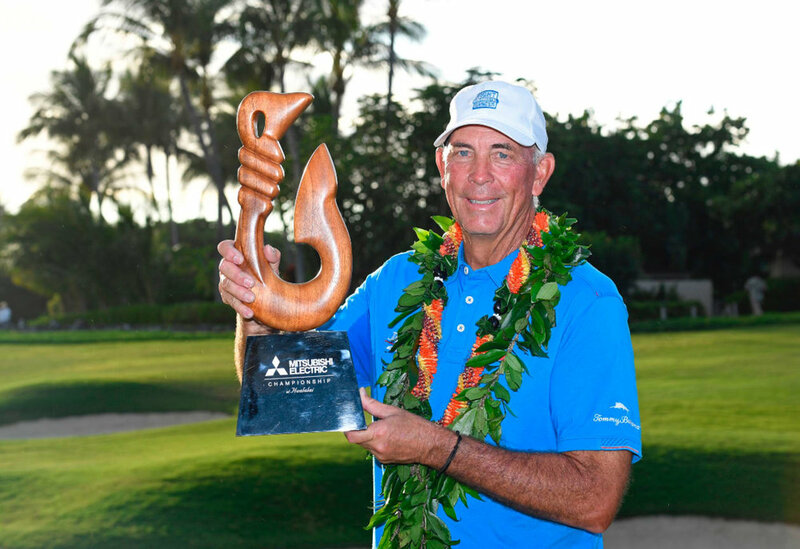 KAILUA-KONA, Hawaii -- Tom Lehman rallied to win the PGA TOUR Champions' season-opening Mitsubishi Electric Championship on Saturday, taking advantage of David Toms' closing three-putt bogey. Sunday was more than just Tom Lehman winning his first Principal Charity Classic golf tournament. It also was about a father’s relationship with his daughter. It was about Tom and Rachael. Together, they won this weekend’s weather-shortened PCC, dad’s 36-hole total of 131 giving daughter her first win as a caddie — and him his first win at Wakonda since he played in college at the U of Minnesota — but we’ll get back to that. Together, they shared laughs while walking up and down Wakonda’s mountain-like fairways Friday and Saturday. Together, they hung out back at the hotel near Jordan Creek Mall, dined at Jordan Creek’s restaurants, and, ahem, shopped at Jordan Creek’s shops. “I’m really happy for her — thrilled for her that she’s able to be here,” Lehman said after winning. “What makes a great caddie is one who says the right thing at the right time — no more, no less. I don’t need help reading a putt; I don’t need help picking a club; I don’t need help getting yardage. “I grew up playing golf. I became a professional because I was good at it, so I don’t need somebody to re-teach me how to do it. “Most importantly, what I expect of a caddie is to say the right thing at the right time — and she does. She’s so encouraging and she’s fun and she’s funny. She always comes up with the right words, no matter the situation. Lehman defined that “coming full circle cliché,” Sunday — and it didn’t matter that it happened during a rain-shortened event. Forty years after winning a tournament at the Wakonda Club during Drake Relays week of 1978, he won at Wakonda again. This one was abbreviated, thanks to rain, thunder and lightning, but that’s OK. After so many years on the tour, everything evens out. “It happens, and it’s part of the game,” Lehman said. “When guys win with a delay, you’re always happy for them (and) frustrated that you didn’t get that chance. Lehman’s been close in this tournament, but Sunday was the first time he hauled out the trophy — and, interestingly, his day started at the Mall. That’s right. Lehman was shopping with his daughter/caddie at a store called Sephora when Tom’s cell phone went off. The caller told them to get to the course as quickly as possible. This was different. It was raining. Lightning filled the sky. Thunder roared. With each of the handful of delays, Lehman said he felt “like a field goal kicker getting iced — but each one lasts 30 minutes.” Lehman isn’t a newbie to this sport. He won the U.S. 2010 Senior PGA title. He's as wise as they come. He knew that more than 4 hours of weather delays, followed by a phone call, probably meant that runners-up Scott Parel, Bernhard Langer, Woody Austin and Glen Day probably wouldn’t be getting an opportunity to do an anything about the two-shot lead Lehman held after firing this tournament’s best two-round total in history. Given the weather forecast and the lateness in the afternoon, he pretty much knew his 13-under, 36-hole score of 131 was gold. It wasn’t until he was in the car, however, that he knew for sure. But really, Tom, shopping at a store that specializes in cosmetics while waiting for your tee time at what could be your first PCC title after seven previous tries? “I didn’t see this coming,” he said. “I thought there would be a delay until the middle of the afternoon.” Thankfully for the winner, he played well Saturday — his 7-under 65 included eagling the eighth hole. Thankfully for Lehman, he was 4-under par over the second round’s final 10 holes — despite bogeying the 18th. Thankfully for him, his caddie — that’d be daughter Rachael — said all the right things. She’s never swung a club. She doesn’t line up putts. She carries dad’s bag and she provides moral support like only daughters can. Nothing more. Nothing less. Tom Lehman's daughter, Rachael, caddied as her father won his first Principal Charity Classic “I try to let him do his thing,” she said. “I don’t want to distract him, but if he does something where — if he misses a putt ... then I’ll say something along the lines of 'forget about it. The next hole’s a new hole. '” How cool would this have been had this been Father’s Day? Oh well. Columnist Randy Peterson has been with the Register for parts of five decades. You can reach Randy at rpeterson@dmreg.com or on Twitter at @RandyPete. DES MOINES, Iowa (AP) -- Tom Lehman was standing outside of a Des Moines-area makeup shop waiting for his daughter/caddie when he got the call to head back to Wakonda Club. Lehman told Rachael Chapman to pay her bill at Sephora as quickly as possible -- because dad had a trophy waiting for him at the course. Lehman, the second-round leader, took the Principal Charity Classic after weather washed out the final round Sunday. Tournament officials had delayed the start of the third round by nearly five hours because of bands of light but persistent rain before calling the event. With Lehman set to tee off last, he and Chapman went to a nearby mall to kill some time before the weather cleared out. But it never did -- with officials delaying it nine times before calling it. "It's like a field-goal kicker getting iced nine times but each one lasts 30 minutes," Lehman said. "There's times when you play that you know that the forecast on Sunday is really lousy and that it's really important that you try to get in Saturday night in the lead if you can because of the chance you might not play. I didn't see that coming." 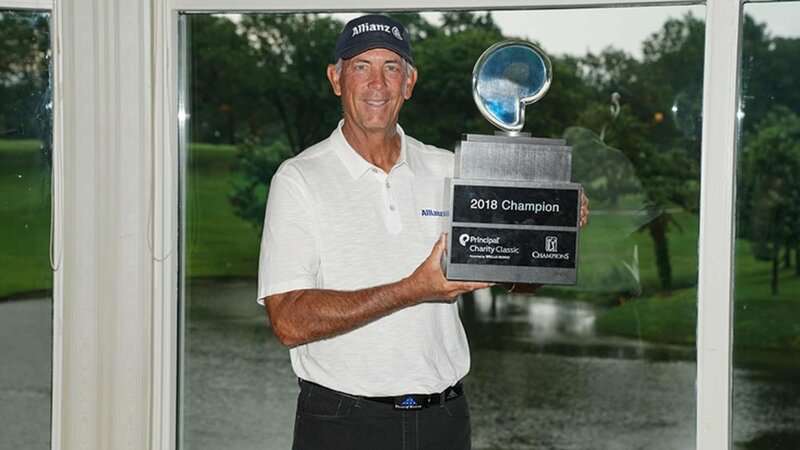 From neighboring Minnesota, Lehman won for the 11th time on PGA TOUR Champions. "It's nice to be in the winner's circle no matter what. Whether it's rain-shortened or not, it's a confidence booster. (I) played a lot of really good golf this week," Lehman said. • The win is the 11th in Lehman’s PGA TOUR Champions career. He is T24 on the Tour’s all-time wins list. • The last time Lehman won a weather-shortened tournament was in 1991, when the final round was cancelled and he won a nine-hole, three-man playoff at the Web.com Tour’s Gulf Coast Classic in Gulfport, Mississippi. • Lehman is one of 14 players that has won on the Web.com Tour, PGA TOUR and PGA TOUR Champions. • He is the only player that has been named Player of the Year on all three tours. • Lehman won in his seventh start at the Principal Charity Classic, and all 20 of his rounds have been under par. He has seven top-10s and he has a 68.43 scoring average since the tournament moved to Wakonda Club in 2013. • Lehman won the Charles Schwab Cup in 2011 and 2012, and he ranks No. 4 all-time in weeks as the Charles Schwab Cup leader (32). This season, he has five top-10s and he is now No. 10 in the standings. 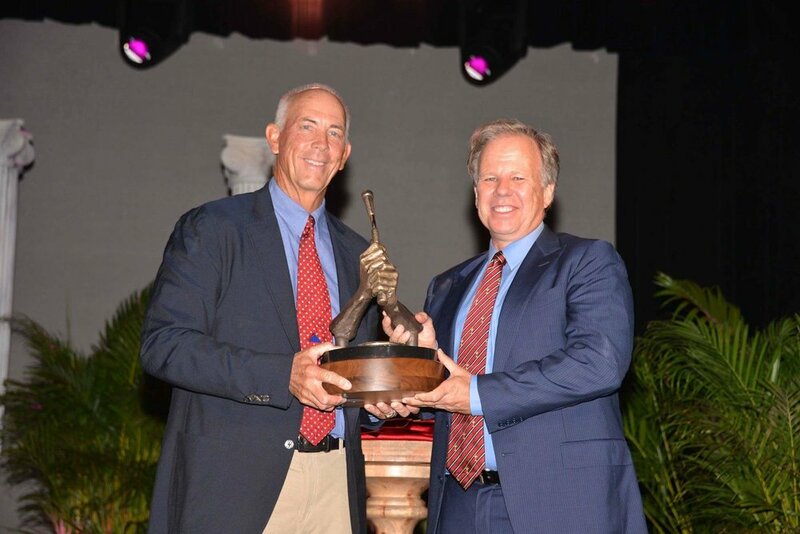 Tom Lehman wins prestigious Dave Marr Award at the annual Player’s Dinner on Thursday evening in The Woodlands, TX. Created in 1999 to honor individuals who exemplify the traits Mr. Marr lived by – sportsmanship, honesty, integrity and a passion for the game of golf – Lehman joins a prestigious list of winners who have done remarkable things both on the golf course, and in their communities. 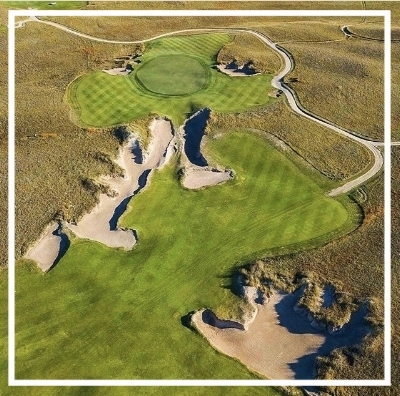 World renowned golf course designers have called creating courses in the Sandhills ‘a gift from the Golf Gods’. Up here, the land creates the golf course and not the other way around. Valentine is blessed to have some of the top courses in the nation located near by. In fact The Prairie Club is consistently one of the top 100 courses in the nation according to Golf Magazine. Valentine also has one of Tom Lehman and Chris Brands' newest courses. The Frederick Peak Golf Club just opened for the 2018 season and is awaiting you and your group. TOKYO, Japan—The doors opened and the brilliance of the Imperial Palace was illuminated by dozens of camera flashes. For eight PGA TOUR Champions players, the moment truly showed the significance of the inaugural JAPAN AIRLINES Championship—not just for a city or region but for the entire country. Shinzō Abe welcomed eight players to his office in the heart of Tokyo on Tuesday night, and it became clear that this week’s first official PGA TOUR event in Japan is an accomplishment being celebrated in both a historical and modern context. The Prime Minister took photos with each player—Billy Andrade, Olin Browne, John Daly, Jay Haas, Tom Lehman, Scott McCarron, Larry Nelson and Tom Watson—and it was followed by another round of media photos as the group exited the Imperial Palace. The Prime Minister noted golf’s diplomatic impact and how the sport helped unify Japan and the United States after World War II. His grandfather, Nobusuke Kishi, was Japan’s Prime Minister from 1957-1960, and Kishi’s relationship with U.S. President Dwight D. Eisenhower was largely formed on the golf course. “(Kishi) said that the relationship between the two countries became as close as ever and the leaders’ friendship on the golf course extended further, leading them to take on the efforts of amending the Japan-U.S. Security Treaty, which now builds the foundation of today’s Japan-U.S. alliance,” Abe said. Abe has followed in his grandfather’s footsteps, as he played 27 holes with U.S. President Donald Trump in February. He teased about the precise outcome of the match, saying the scores were “state secrets” but emphasized that golf continues to unify the two nations. On behalf of the 63 players competing in the JAPAN AIRLINES Championship, Watson echoed Abe’s sentiments and offered gratitude as only a World Golf Hall of Famer can. “I share your understanding of how golf brings people together,” Watson said. “I’ve been coming to Japan for many years, as Larry Nelson and many of us have, to play professional golf. We're very lucky to be able to play a game for a living and compete around the world. Japan is one of our favorite places to come and we’ll be coming back again.” Watson is the owner of two Dunlop Phoenix victories on the Japan Golf Tour, in 1980 and 1997. Japanese media captured every moment of the 30-minute visit, which was compared favorably to occasions when the Prime Minister has hosted Japanese Olympic medalists and baseball players. By opening his doors, Prime Minister Abe also opened the JAPAN AIRLINES Championship, a first on the schedule and another milestone for the countries. The JAPAN AIRLINES Championship begins Friday at the Taiso Kawata-designed Narita Golf Club, with players vying for the U.S. $2,500,000 purse, $400,000 going to the winner. OWASSO - The Folds of Honor Foundation honored long time supporter Tom Lehman with the 2017 Corporal Brock Buckling Patriot Award at this years Patriot Cup Invitational Gala during Memorial Day Weekend. Lehman, who has supported the Folds of Honor since its inception and was present again this year at the Patriot Cup Monday, joins a prestigious list of past recipients, including golf legend Jack Nicklaus, President George W. Bush, PGA Tour Champions player Corey Pavin and PGA Tour player Rickie Fowler. For the first time in award history, a panel of six men, David Bond, David Charney, Dr. John Rooney, Paul Sizemore, Sanjay Meshri and Tom Russell, have been named as this year's Colonel David "Flap" Kirst Award winner. Previous recipients of this award include FOX News producer, Gavin Hadden, Rocky Sickmann and Brian Whitcomb. "Tom inspires us all to be better, its a gift. He truly places service before self. He is a blessing to all that know him," said Major Dan Rooney, Folds of Honor founder. Lehman won the 1996 Tour Championship at Southern Hills Country Club in Tulsa during a year he also won the Open Championship and narrowly missed in the U.S. Open and was Player of the Year on the PGA Tour. He also finished second to Frank Conner in 1991 in a Ben Hogan Tour event held at The Golf Club of Oklahoma. The Corporal Brock Bucklin Patriot Award is presented to an individual who displays unwavering, meritorious and extraordinary qualities of leadership, service and dedication to advancing genuine patriotism in America. The namesake for this award, Corp. Bucklin, sacrificed his life in defense of America's freedoms; his sacrifice is memorialized in this award and was the driving force for the creation of Folds of Honor. The recipient of this award recognizes such sacrifices and supports those who have made them. The characteristics of this prestigious award are in keeping with the best traditions of the United States of America, its founders and its defenders. Bucklin's son, Jacob Green, was the first scholarship recipient from Folds of Honor. "These are amazing patriots committed to serving those who serve us," said Rooney. "We are very proud to have these men as members of the Folds of Honor family and are thrilled to present each of them with the Kirst Award." The Colonel David "Flap" Kirst Award is presented to an individual who demonstrates service before self, integrity first and a commitment to excellence. Col. Kirst was a great fighter pilot, husband and father. HIs life embodied the traditional American values that make this country great. Flap mentored Major Dan Rooney over the years and pushed him to become a fighter pilot. He passed away of a heart attack in 2013. Flag was a huge supporter of Folds of Honor, a positive force in society and an example of a great American. Lehman and Bond, Charney, Rooney, Sisemore, Meshri, and Russell were presented with their respective awards at the Patriot Cup Invitational Gala on Sunday, May 28, which accompanies the Patriot Cup Invitational, a weekend golf tournament and National gala celebrating our nation's heroes. This patriotic event is attended by players from the PGA Tour, PGA Tour Champions, and military golfers from across the country and a host of celebrities to create an unforgettable experience for the families of fallen and disabled service members. All event proceeds benefit Folds of Honor, an organization dedicated to providing educational scholarships for the children and spouses of fallen or disabled veterans. For more information or to donate in support of a Folds of Honor scholarship, visit www.foldsofhonor.org.